If you find yourself mulling over possible monikers for your baby-to-be, or are torn between traditional or trendy, read on to find what experts are saying about the latest happenings in the baby name game. Plenty of trends are making their way through the baby name circuit these days. Jennifer Moss, founder/CEO of BabyNames.com and author of The One-in-a-Million Baby Names Book, notes what's influencing parents-to-be in 2013. For girls, turn-of-the-19th-century names are big: Charlotte, Eloise, Hazel and Mabel. Little boys are finding themselves with Celtic- or Irish-influenced monikers, such as Liam, Aidan, Declan and <?xml:namespace prefix = st1 ns = "urn:schemas-microsoft-com:office:smarttags" />Logan. Equally prevalent for boys and girls are surnames as first names, like Harrison, Mason, Harlow and Harper. "I see a swing back to more traditional names, fewer fanciful spellings and invented names," observes Linda Rosenkrantz, co-owner of Nameberry.com and co-author of 10 baby names books, including Cool Names for Babies and The Baby Name Bible. She notes that there is more "gender bending, with girls taking over boys' names like Avery, Harley, Finley, Ellery and Elliott." For girls, flower power is prevalent, with monikers like Azalea, Zinnia, Poppy and Clover, while boys are seeing a Latinate influence with such names as Atticus and Maximus. With an eye toward Hollywood, baby names experts look at which celebrity parents have been drawing attention with their own choices. Moss sees the impact of Beyonce and Jay-Z's daughter Blue Ivy—but more with her middle name than her colorful first name. "Ivy jumped from #89 our popularity lists in 2011 to #54 in 2012," she says. Angelina Jolie and Brad Pitt's daughter Vivienne has been another name to copycat. The Kardashians are another influential name, notes Eleanor Turner, author of Baby Names 2013 (White Ladder Press). "Kourtney's son Mason was a big hit with parents, and it will be interesting to see if Penelope was popular last year, and whether Kim's baby (due this summer) will follow suit," she says. Turner also expects that the arrival of the royal baby will impact the baby names category. "The name Diana was massively used throughout the 1980s, and both Catherine and William are consistently in the Top 20," she adds. Last year also saw the movement of Maxwell from boys to girls, which Rosenkrantz points out in baby daughters of singer Jessica Simpson and actress Lindsay Sloane. The name Camden was recently used by Nick and Vanessa Lechey, reality TV star Kristin Cavallari and musician Eric Gunderson. "If anything, I think this shows that people, including celebs, are using place names with little regard for the place [Camden, New Jersey] itself," quips Rosenkrantz. If you find yourself moving away from trendy choices in favor of those names that are more personal, you're not alone. 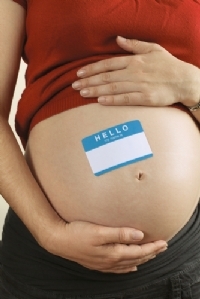 According to the experts, family names still have a tremendous affect on baby naming. "At Nameberry, we find parents maintaining a very deep and committed sense of family history, many parents passing down both traditions and individual names," says Rosenkrantz. Adds Moss, "Although people are less likely to name a boy after his father, they are using family surnames. It's a great way to honor the whole branch of a family tree." Even if you're not set on devoting your child's first name to your heritage, middle names can be influenced by a family's lineage. "Some Spanish-speaking cultures use the mother's maiden name as a middle name for their children, which is kind of cool," notes Turner. In the end, whether or not you decide on an A list-influenced name or a more traditional choice, it helps to keep certain considerations in mind. Don't hold on to a name for nostalgia's sake. "A lot of people—let's face it: girls—spend their childhoods coming up with fanciful names they want to give their children," says Rosenkrantz on Nameberry.com's blog. "But if the name you always loved has suddenly become uber popular or clashes with your new last name, let it go." It's also important to remember that the name you give your child is one that will last a lifetime. "We tell parents to step into their child's shoes and project what life will be like with the name you're considering," says Moss. "Is it easy to spell and easy to pronounce? Will it be easy to taunt? Don't make the name a burden on your child." Finally, Turner advises new parents to "fall in love" with the name they've chosen. "Having a special story or meaning behind your choice can be nice for your child to learn about when they're older," she adds.